Georgia is easily one of the most haunted places as well as haunted states in the South. There are several tales of haunted hospitals in Georgia, including full-bodied apparitions reported, especially soldiers. Are There Haunted Hospitals in Georgia? The only difficulty when researching haunted hospitals in Georgia isn't finding them, it's finding the best ones. There are many hospitals in the state where visitors have reported a great deal of ghostly activity. In order to assist you with deciding which one to visit first, the listing below identifies the site's ghost haunting level; 1 for only slightly haunted and 10 if visitors are almost guaranteed to experience paranormal phenomena from ghosts and apparitions to disembodied voices and unexplained sounds/movements. Georgia was the location for a great deal of gruesome battles during the Civil War, and a number of buildings used for hospitals remain haunted by the spirits of the soldiers who died there. Reports of ghosts dressed in military attire are common apparitions. The Marine Hospital, built in 1905, served as a hospital for sailors who would get sick while out at sea. Considering the lack of medical knowledge at the time, many sailors died in the quarantine ward that was created to keep seriously diseased sailors from spreading disease throughout the hospital. The beautiful, historic stone structure stands at the corner of York and Drayton Streets and features beautiful architectural details. Oversized windows in the rear and many windows lining all sides of this empty structure afford the locals with occasional glimpses of long-dead sailors walking past those windows. Considering that the Civil War was one of the bloodiest conflicts in U.S. history and where there were more deaths on U.S. soil than any other war, it makes sense that any building that served as a military hospital during this war would have seen a great deal of death and suffering. The Old Civil War hospital in Madison, Georgia is one such place. Investigators who have visited this location report a multitude of creepy phenomena, including the apparition of a man dressed in black standing at the top of the stairs, various sounds throughout the building like footsteps on the stairs, a bouncing ball in the hallway and sounds of movement in the basement. Visitors also report seeing the apparition of a lady in a vintage blue dress in one particular room. The Marshall House is now a hotel, but was originally a Civil War hospital where countless patients died. During its restoration, workers climbing through the crawlspace under the building discovered human arm and leg bones. Historians believe that the human bones were the amputated limbs of severely injured soldiers. Today, visitors still report seeing ghosts of soldiers wearing Civil War period dress on the third floor. Other buildings throughout Georgia are either abandoned stone structures or modern hospitals. In every case, visitors, patients, and employees report countless encounters with apparitions and other phenomena. Friendship Nursing Home, located just off highway 129 in Cleveland, is an 87 bed assisted-living facility for the elderly. Residents who live at Friendship are never thrilled to see the apparition of a little boy with a red cap who has been spotted roaming the halls. In several instances, he was spotted sitting outside in the wintry cold. Residents apparently felt so bad that they would toss their sheets and blankets out to the apparition. A legend has started among residents and staff that each time the little boy with a red cap is spotted, three residents will pass away. This gothic stone structure, undergoing renovations since 2007, is well known throughout paranormal circles as one of the more haunted locations in the state. Visitors report feeling numerous cold spots, investigators have captured electronic voice phenomenon (EVP), and in one case an investigator reports being pushed by an unseen entity. Visitors to this abandoned hospital reported seeing apparitions of both patients and staff. Since renovations began in 2007, owners have not allowed paranormal investigators to tour the building. 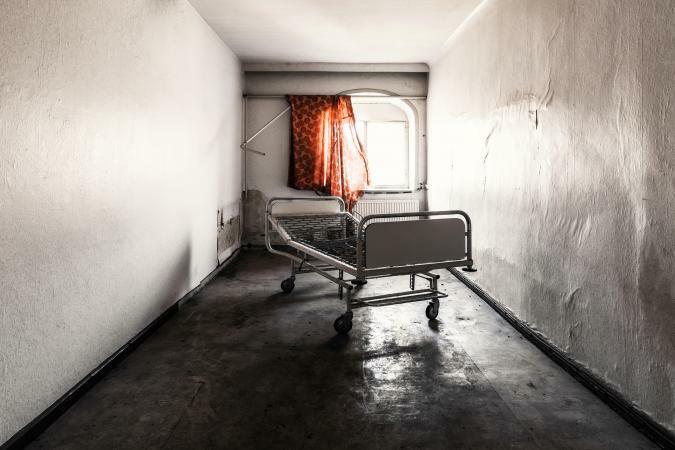 It's not unusual for hospitals to be haunted, especially those where there has been great emotional energy expended such as might arise during the Civil War. And while hospitals aren't the only haunted places in Georgia, you'll find they often factor into ghost stories and ghost walks from the state.